This Arch Polished Chrome Soap Holder with Glass Dish will make a perfect Christmas gift for newlywed’s, friends or relatives who are redecorating, or anyone who’s starting to build a home.This elegant soap holder features a polished Chrome plated surface that provides outstanding quality and shine, and will surely last a long time without fading or changes in color due to soap and water reaction. 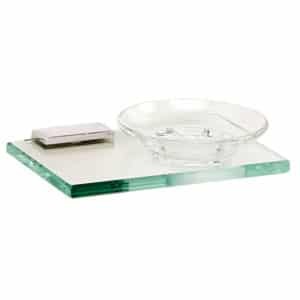 This polished chrome soap holder comes with a beautifully crafted glass dish, which can serve as a container for your small bathroom items, or as temporary storage for watches, jewelry, and loose change or other items you would remove before showering. The Arch Polished Chrome Soap Holder will make a truly unique gift for just about anyone on your Christmas list this year. The tasteful design is very versatile and can fit nicely with almost any decor. Order yours today!